Our Standard Bubble Bags are made with a high quality 400 thread count nylon sidewall and a European heat stamped screen. They are a good choice for the home user looking for a high quality extraction bag, and carry a five year warranty against defects. 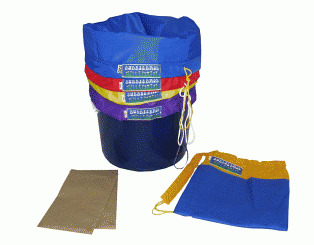 This Standard 1 gallon 4 bag kit contains a work bag, a contaminant removal bag, and two crystal collection bags. It also includes a blotting screen and carrying bag. Note: The 1 Gallon Standard Bubble Bag kits can process up to two ounces (dry weight) of plant material at a time. This kit is only suitable for processing small amounts for personal use. The bucket shown is not included. Share your experience about Standard 1 Gallon 4 Bag Kit (S4) with other customers. Submit your tips or thought on this product, be detailed and specific.